Of all the features I’ve read about regarding the Sony A7RIII, this is the one that’s probably impressed me the most. I don’t often shoot tethered, but when I do, it’s often quickly. Usually, I’ve got animals in front of the camera, and they tend not to take direction very well. So, I’m shooting fast, then waiting for the computer to catch up. According to this video from photographer Evan Guttman, that waiting all goes away with the new A7RIII. In burst mode, it manages to transfer shots from the camera to Capture One in under a second each over USB3. And yes, he’s shooting raw, not jpg. For many photographers, shooting tethered is a way of life. For others, it’s something we only do occasionally when the need arises. The big problem all tethered shooters face, though, is the cable not falling out. Sometimes, with a long cable, it can fall out under its own weight. Sometimes it gets tugged, yanking it right out of the socket. And if this happens often enough, it can even damage the socket itself. There are commercial solutions out there to help prevent this from happening. Solutions such as the JerkStopper and Tetherblock work beautifully. But sometimes you find yourself tethering without these options to hand. So, in steps the humble rubber band, thanks to a tip posted by Redditor, lilgreenrosetta (photographer, David Cohen de Lara). Anyone who has ever taken self-portraits will know the exhausting little jig that goes from in front of the camera lens, and around to check the screen on the back. I’m pretty sure they now have this merry little dance down as fitness routine in your local gym, they call it the selfie workout! I joke, but anyone who has been dressed in full costume, running back and forth in a warm room. Wiping the sweat from their brow, and jumping back again before the timer runs out, will know my pain. The image above was created through this very technique. I recently decided to purchase a tether cable from Amazon, not only would it help with self-portraits. But it would also be very handy to have whilst shooting models, who don’t have to squint to see themselves on a small screen on the back of my camera. My program of choice for this………Lightroom! Now before I hear a harmonic cry of ‘you should be using Capture One’ bellowing over the hilltops. Let me fill you in on my experience of tethering through Adobe’s image processor and organizer. And you too will find taking self-portraits like this easier…. I have used the Camranger before on tradeshows and it was very smooth. The Case Air appears to be no different. It provides several nice functions: sending the files you shoot into a tablet/computer; A basic monitor; some focus peaking and so on. Well, it looks like the issues with EyeFi may not be a problem for Canon shooters. At least, not all Canon shooters. 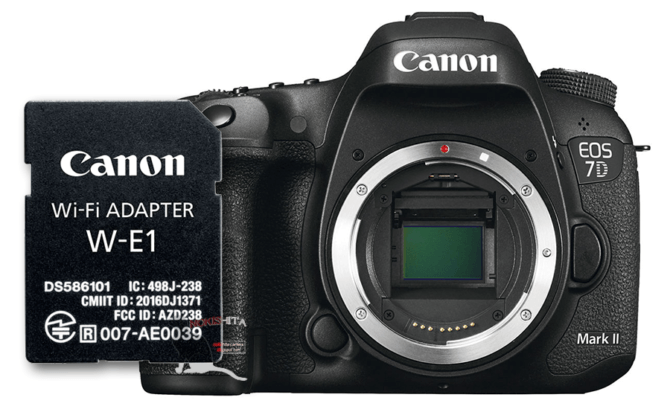 A couple of weeks ago, Digicame-info reported that instructions and specs for Canon’s new W-E1 WiFi adapter had been leaked. One point of note was the listed dimensions. 24x32x2.1mm; the same as the SD card specification. Now, new leaked photos confirm that this seems to be true and it is an SD card. Also leaked is some camera compatibility. Interestingly, the impending 5D Mark IV doesn’t appear in that list. This may confirm the rumour that the 5D Mark IV does, indeed, have built in WiFi. Well, this weekend, I’ve discovered a $40 alternative. All you need is a TP-Link MR3040 Battery Powered 3G Wireless Router and a $9 app called qDslrDashboard (Android or iOS). SnapBridge is Nikon’s new Bluetooth remote control protocol & mobile “tethering” system featured in their newest DSLR the Nikon D500, as well as several of their upcoming compact cameras. In anticipation of their impending release, Nikon have now released the other half of this equation in the form of an Android app, with an iOS version expected to arrive during the summer. Focusing a self portrait is hard, but focusing a self portrait at with Canon’s 85mm f/1.2 lens fully open is almost impossible. F/1.2 is so shallow that even the slightest movement will make your eyes blurred and your nose (or ears) tack sharp. While definitely difficult, it is not impossible, and British photographer Joseph Parry nailed a workflow to make it work. (if you don’t believe it’s possible, just look at how sharp the eyes are at the portrait above.